Amy is a ceramic sculptor who grew up in a small city in Central New York. 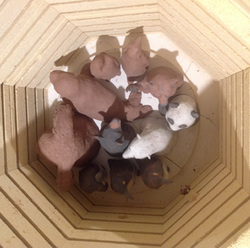 She works primarily in terracotta and polymer clay. Her work explores themes like humanity’s impact on our environment, the human figure, self-esteem, and themes of motherhood. She is a member of the Pittsburgh Society of Sculptors, Cranberry Artists Network and the West Hills Art League. She has exhibited regionally at the Westmoreland Museum of American Art, the Bottlebrush Gallery, the Morgan Glass Gallery, Robin Hill Park, Sweetwater Center for the Arts, North Hills Art Center and the Sewickley Library. She holds two bachelor’s degrees from the State University of New York at Plattsburgh, one in French, the other in Fine Art with a concentration in Sculpture. She also spent time in Europe studying French and painting. You can currently find Amy creating in her studio. Through my art I try to understand how humans affect our physical and psychological worlds. I grew up in the Finger Lakes Region of New York State. Living in such close proximity to nature, my early years were filled with climbing trees, boating, biking alongside farmlands, cross country skiing in those same farmlands, canoeing in rivers, swimming in gorges, walking next to waterfalls and playing in beautiful parks. These early experiences filled my life with a deep appreciation of nature and animals and a strong desire to protect the very environment that brought me such joy. When I became a mother my desire to protect and preserve our environment along with my childrens' emotional well being became stronger than ever. I find it distressing that we as Americans value consumerism more than nature and altruism. Through my study of the environment and my natural love of animals, I learn more and more about the impact mankind has on animals who have no voice. Deforestation, pollution, plastics in our environment and oceans, polluting farmlands with chemicals for capital gain are some of the areas that we must change if we are to sustain life. In my latest series, I explore the beauty of animals, our impact on them and ultimately how our actions impact us. 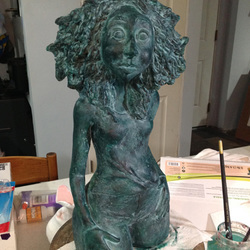 I sculpt in terra cotta clay which by its very nature is earth. I incorporate some plastics through polymer clay by using it to sculpt skulls showing the dichotomy of earth and our destruction. In my human figures, there is a sadness but also hope portrayed in their eyes. Some of the animals I sculpt are extremely vulnerable to dwindling habitats and are on the endangered species list. Some are just a reminder to appreciate the beautiful creatures amongst us. My hope is to create a discussion about what we value as humans and draw attention to how our actions have an impact on the world.